BERLIN: The German government said on Monday it was in talks with its allies about a possible military deployment in Syria, prompting a sharp rebuke from the Social Democrats (SPD) and setting up a fresh conflict in Chancellor Angela Merkel’s loveless coalition. Overseas military action remains a sensitive and deeply unpopular topic in Germany, given its Nazi past. Participation in any air strikes in Syria would also put Germany on a collision course with Russia, the main backer of President Bashar al-Assad. Government spokesman Steffen Seibert said Germany had discussed with the United States and European allies its possible military involvement if Assad’s forces used chemical weapons against the last major rebel stronghold in Idlib, now under heavy Syrian and Russian bombardment. “There has not been a situation where a decision has had to be made,” Seibert told a regular news conference, adding that any decision would first have to be approved by parliament. Earlier, Bild newspaper had reported that Germany’s conservative-led defense ministry was examining possible options for joining US, British and French forces in any future military action if Damascus again used chemical weapons. It said parliament would only be notified of any military action after the fact if speedy action were required. Andrea Nahles, leader of the SPD – junior partner in Merkel’s coalition – ruled out backing any German involvement. 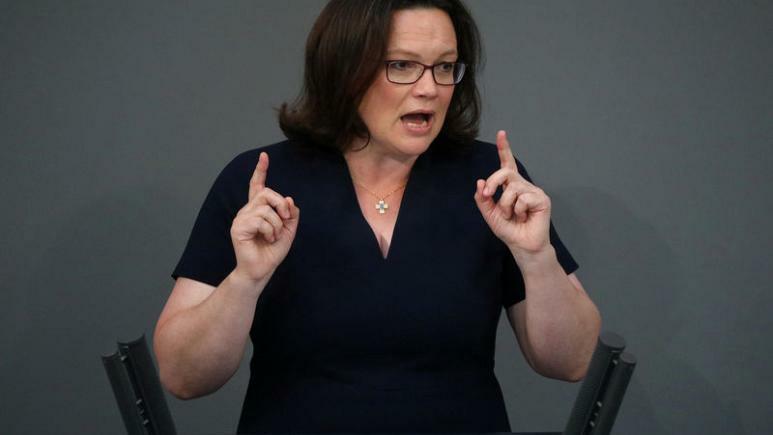 “The SPD will not agree – either in parliament or in the government – to the participation of Germany in the war in Syria,” Nahles said in a statement, adding the party backed diplomatic efforts to avert a humanitarian crisis. Sources familiar with the issue, confirming the Bild report, said German and US officials had discussed last month the possibility of German fighter jets helping with battle damage assessments or dropping bombs for the first time since the war in ex-Yugoslavia in the 1990s. The German air force already provides refueling support and carries out reconnaissance missions using four Tornado fighter jets from a base in Jordan as part of the US-led coalition fighting the Islamic State militant movement in Iraq and Syria. Bild said a decision on whether to join any strikes would be made by Merkel, who ruled out joining April 2018 air strikes against Syria by US, French and British forces after a previous use of chemical weapons. In a joint statement on Monday, the German foreign and defense ministries urged restraint in Syria. “The goal is that the conflict parties … avoid escalating an already terrible situation … That is particularly true for the use of banned chemical weapons which the Assad government has already used in the past,” it said.